That time of year has rolled around once more! It’s the third annual Titanium Ranger Day! October 28th 2013 started it all when our colleagues at Rangercrew got together with Bandai Cards to help promote the Titanium Ranger with the official reveal of his Power Rangers ACG Card and a live chat with his actor Rhett Fisher! What began as a simple day of appreciation for the character has grown to be much more than that. 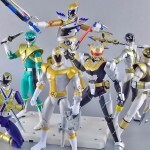 Not only did Titanium Ranger make his way into the ACG that year, but he was 1 of the final 5 rangers selected in Morphin Madness, became part of the exclusive Power Morphicon 2014 Ranger Key Pack, had a 5″ Super Megaforce Legendary Ranger figure, AND made it into the finale of Power Ranger Super Megaforce! 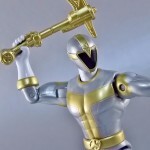 As the first ranger ever to be solely featured in Power Rangers (Lightspeed Rescue) with no sentai counterpart for his basis, Titanium Ranger is one of the most unique creations in the entire Power Rangers franchise. Appreciation for the Titanium Ranger & Rhett Fisher himself has been on the rise for years. It’s no coincidence that the last few years have been very kind to the character. We here at TokuNation are proud to celebrate another Titanium Ranger Day! Celebrate Titanium Ranger Day 2014! That time of year has rolled around once again! It’s the second annual Titanium Ranger Day! October 28th 2013 started it all when our good friend Fury Diamond of Rangercrew got together with Bandai Cards to help promote the Titanium Ranger with the official reveal of his Power Rangers ACG Card and a live chat with his actor Rhett Fisher! What began as a simple day of appreciation for the character has grown to be much more than that. Not only did Titanium Ranger make his way into the ACG with his own card, but he was 1 of the final 5 rangers selected in the Morphin Madness competition, he was recently featured in an exclusive Power Morphicon 2014 Ranger Key Pack, had a 5″ Super Megaforce Legendary Ranger figure produced of him, AND made it into the finale of Power Ranger Super Megaforce with the returning Legendary Rangers! As the first ranger ever to be solely featured in Power Rangers (Lightspeed Rescue) with no sentai counterpart for his basis, Titanium Ranger is one of the most unique creations in the entire Power Rangers franchise. Appreciation for the Titanium Ranger & the actor who portrayed him, Rhett Fisher, has been on the rise for years now and it can’t be any coincidence that the character has gotten so much love this year alone at the height of the Power Rangers recent 25th anniversary. And we here at TokuNation are proud to celebrate another Titanium Ranger Day! Feel free to click “discuss on the TokuNation Forums” at the bottom of this post to join our Titanium Ranger Day discussion thread. And while you’re at it follow the handy links below to check out a hefty selection of Titanium Ranger photo galleries we’ve posted this year. TokuNation is continuing a Titanium Powered week of galleries with another winner, Super Legends Titanium Ranger! Following up on our 5″ Super Megaforce Titanium gallery we wanted to take a look at the first “super” figure of this character. Super Legends was a brief albeit very popular line of roughly 6″ scale rangers (and 1 villain) inserted into case assortments of Power Rangers Jungle Fury & RPM figures. Unfortunately the line ended prematurely when the Power Rangers franchise was cancelled with RPM, but of the figures released Titanium Ranger is one of the best. It fact it’s one of the best figures ever released of the character. Super Legends Titanium Ranger is a must own if you’re a fan of the character at all. Check out 40 images of this great figure as well as a full review by clicking “Discuss on the TokuNation Forums” at the bottom of this post. And be sure to stay tuned this week as we bring you images of the long awaited Power Morphicon Ranger Key Set featuring Titanium Ranger & Jungle Fury Wolf Ranger! Talkin Toku Episode 016 Released – Prelude to Gaim Finale! It’s time for another episode of Talkin Toku! Join Kickback, Den-O, Sentai Tamashii, and special guest host Danny as they discuss their thoughts and feelings about the upcoming finale of one of the most well-received toku series in recent memory – Kamen Rider Gaim! In the toy talk segment they discuss the hunt for Power Rangers Super Megaforce 5″ Figures at their local Walgreens, as well as their reactions to the Kamen Rider Gaim Overlord weapons in the upcoming release of the Arms Change Kamen Rider Ryugen Yomi Arms figure. Conversation is lost when … well, the graphic in the story will make a lot more sense. Around 20 minutes in the fact we’re unscripted with no clear direction rears its ugly head as conversation changes to Chuck E Cheese? But take a listen – find out who is right, who is wrong, and who was way off base when the Kamen Rider Gaim live stream airs later this afternoon and releases via sub groups next week! There’s also a bit of talk about Power Rangers Dino Charge, a small wishlist for the 2015 Super Sentai series, and more stuff! Enjoy the episode and we’ll see you on the flip side of the series finale of Kamen Rider Gaim in a little over a week! Click here to download the .MP3 of the episode! * * * NOTE * * *: Slight hiccup when the file went online in the ending theme pushed itself to the very end of the episode. Our bad!! It’s time for another round of Titanium Power at TokuNation! In honor of the Titanium Ranger’s inclusion in the finale of Power Rangers Super Megaforce we’ve got 3 galleries coming up for your viewing pleasure. And the first one is today’s featuring the Super Megaforce 5″ Titanium Ranger from Power Rangers Lightspeed Rescue! 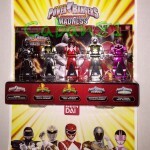 Having only just made it to retail in the final Super Megaforce 5″ assortments, this figure has been spotted mostly at Walgreen’s. And I was lucky enough to stumble across one. As a massive fan of the Titanium Ranger I had to own this guy to display with all my other Titanium figures. If you have the chance, and can find this guy for retail price, then definitely pick him up to compliment your 5″ ranger collection. You can always use another 6th ranger. And we don’t exactly get figure of good old Ryan Mitchell very often. We’ll also be bringing you another pair of galleries later in the week for the Power Morphicon Ranger Key set as well as the Super Legends Titanium Ranger! Stay tuned for these upcoming galleries and for now click “Discuss on the TokuNation Forums” at the bottom of this post to see over 30 images of this unique addition to the line as well as a full review!